Streets of Rage 2 Sega Genesis Game cartridge Cleaned, Tested, and Guaranteed to work! Ordered this and another game, came in the 7 days that it said. Game worked good in my generic Gen and flawlessly in my actual Genesis 2. I was skeptical of buying from here (mixed reviews) but I can say that I definitely will do business with Lukie again. Classic beat em up action. What a trilogy. This title in particular is 90's beat em up action at it's finest. 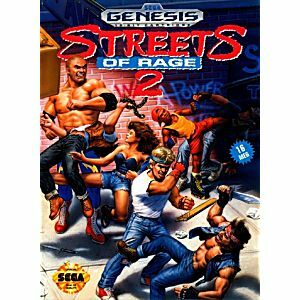 The best beat 'em up on the genesis by far. Sleek presentation, incredible soundtrack, and a kid on rollerblades. Pretty great, but a little repetitive if you're not playing with a friend -- could use a bit more enemy variety. Other than that, pretty nearly perfect. I love this game for the Genesis and is the best in the series. Buy this one if you don't have it. GREAT GAME!! GREAT CONDITION!!! AWESOME!!!! Great game, a true Sega classic! Shipped fast and works great! A fun side-scrolling, 'beat em up', Streets of Rage 2 is a fun game to play by yourself but even better with a friend. One of the better Genesis games, in my opinion! Ohh the many hours I've spent playing this game. It is truly one of the greatest games on the Genesis and one of my personal favorites of all time. The premise is simple; just go through 8 levels beating up street thugs and bosses. Simple but satisfying. 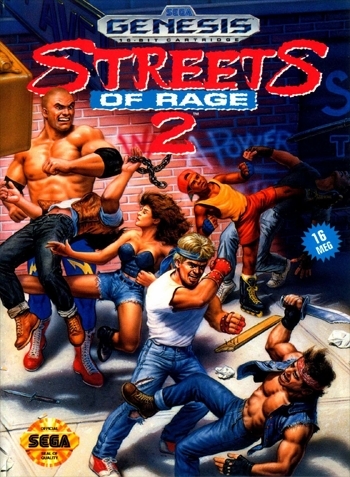 Streets of Rage 2 takes what was great about the first one and makes it better. There are more moves and the controls are more fluid. There's 4 characters to choose from' each with their own unique moves and strengths. Playing this brings back a lot of nostalgia. It's still as great as it was back in the early 90's when I was playing it back then. After buying a new Sega this was the first game I wanted to get. It really is one of the greats. Check it out.